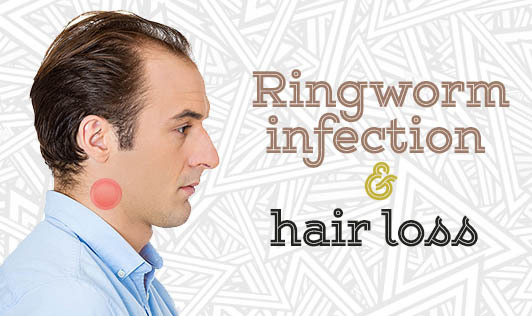 Ringworm infection refers to a fungal infection that usually occurs on the feet, nails, or hair, but can really occur almost anywhere on the body. Also, ringworm has really nothing to do with worms. When the fungal infection hits the hair, it can lead to severe hair loss. The patches may seem dry, itchy, and inflamed at times and severe cases may also be manifested by blisters that ooze. The surrounding hair may experience penetration of the fungus that causes brittleness, weakened hair roots, and hair loss. Certain micosporum strains of fungi can also cause Tinia Capitis. Skin contact, infected pets, combs, unwashed clothing, and unclean pools can also pass on ringworm infection. It is essential to consult a dermatologist in order to rightly diagnose and treat the infection as the infection is often known to be resistant to drugs as well. The right treatment for the recommended duration and dosage is essential.